This page, from the New York Public Library exhibit of Kerouac’s notes and other belongings, offers just one example of the types of outlines he used when putting together his novel. If you’ve ever dared to undertake a novel, you know it would be absolutely untenable not to have a firm idea of who your people are, through and through. I found I needed to know their birthdates, the years when people died and were married, when they attended school, all their relationships. I had to give my novel a “Year Zero” starting point and date everything in relation to that benchmark year. That writing is all consuming cannot be understated. It drains, from the inside out. 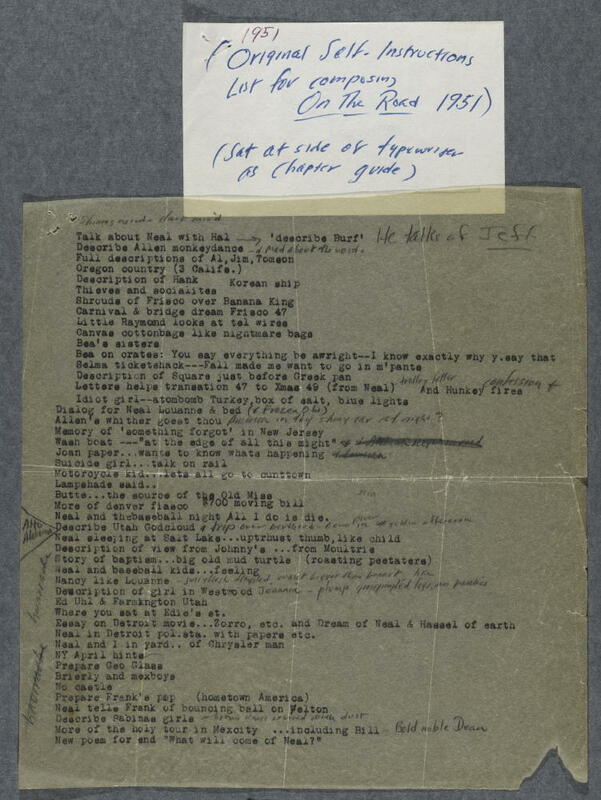 These examples from Kerouac’s papers help us see just how much writers such as Kerouac have given us with their work. Their bequests often have a high personal cost and this reader is gratefully respectful of that work. ABOVE: Jack Kerouac. Original “Self-Instructions” list for composing On the Road. Typescript, April 2(? ), 1951. New York Public Library, Berg Collection, Jack Kerouac Archive. Reproduced courtesy of John G. Sampas, legal representative of the estates of Jack and Stella Kerouac. This entry was posted on February 27, 2008 at 4:38 am and is filed under Uncategorized. You can follow any responses to this entry through the RSS 2.0 feed. You can leave a response, or trackback from your own site.